Snow melt from the Andes transformed in clear water form the Chimehuin River. 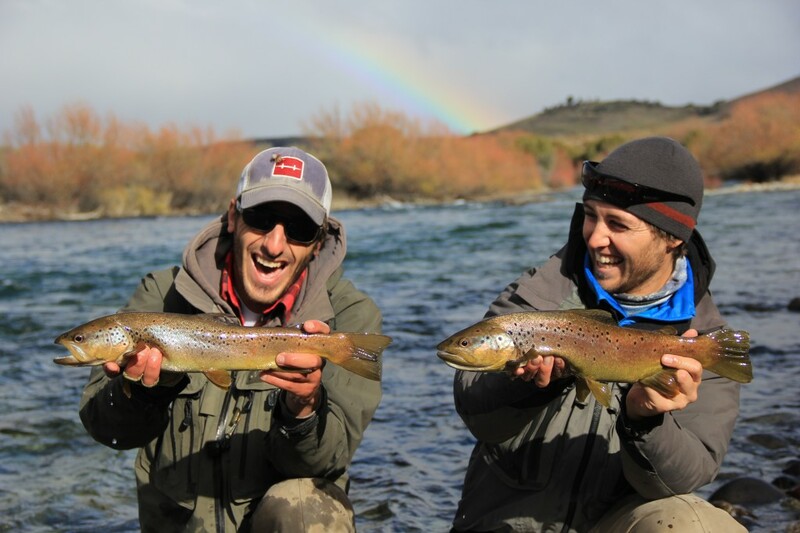 Known a one of the best rivers in the world for fly fishing, this stream of 60 km long, is the habitat of large rainbows and browns who loved its willow banks, big boulders and pool and incredible riffles. This is a medium sized river that has its headwaters in Huechulafquen Lake right on Lanin National Park, known as Mouth of Chimehuin. Stories of brown trouts “monsters” are famous in this area, favorite place of the first fly fisherman from the area, around 1940, like Eliseo Fernandez (almost 20 pounds. ), Charles Radziwell (18 pounds) and the 20 pound brown trout caught by Jose Evaristo Anchorena. This excellent river yields both large sized and quantities of trout. The steep banks, deep pools and river flow provide an outstanding trout environment. 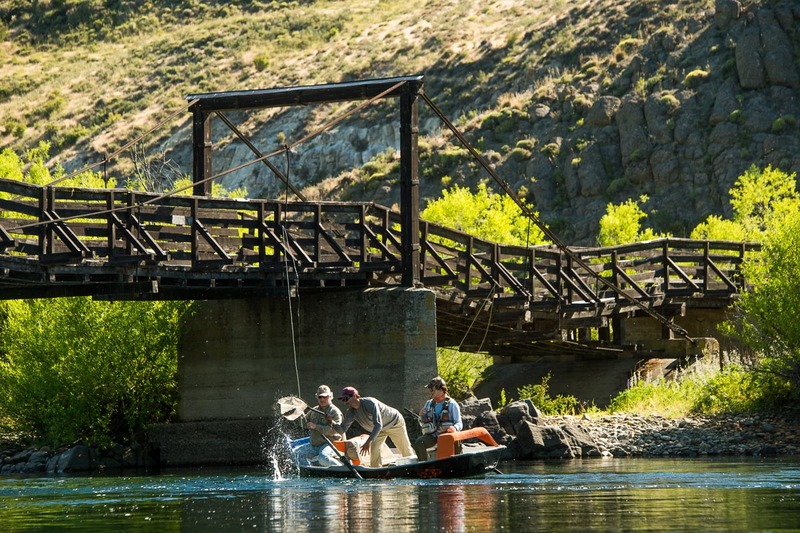 Many of these famed sectors of the river have deep ravines with large rocks terminating in deep pools It is necessary to use heavier fishing equipment. In the smaller arms of the river it is possible to use a variety of fishing equipment. The banks of the river are densely lined with a variety of indigenous and beautiful trees. The trout species that are in the river are both the rainbow and brown trout that weigh between 1 to 6 pounds or 14 to 25 inches. It is possible to catch larger trout, particularly brown trout, but it is important to have knowledge of the river as well as fishing experience to catch the large ones. 1. The Mouth of the Chimehuin (½ mile from the mouth of the river at Lake Huechulafquen until Devil;s Throat). Not only is this section of the river known for the large trout that are caught but, alas, also for the even bigger fish stories of those that got away. The mouth is known for its majesty and stateliness and is recognized as “the mecca of fly fishing”. The uncontrollable passion for this small geographical point has afforded so much enjoyment to fishermen that it was defined by the fisherman Joe Banks as “Boca fever”, meaning mouth of the river fever. According to him, the only way to get rid of the fever was to continually try to fish and learn the intricacies and behavior of these beautiful wild trout. The average size caught in this part of the river is between 4 to 8 pounds with occasional trout between 10 to 12 pounds, but they are not easy to get. 2. The Upper Chimehuin (from Devil’s Throat until town of Junin de los andes). From the mouth of the Chimehuin River toward the town of Junin de los Andes along Provincial Route 61 the first pool of importance is called “Las Viudas” (The Widows). This pool received its name after a day of fishing when an enormous number of fish were taken and all of them were males. Reports made by the C.E.A.N. (Center of Applied Ecology of Nequen) indicated that this pool along with the pools “El Manzano” and “Balsa Vieja” with their proximity to the lake possess the largest quantity of big trout. This whole superior section of the river is accessible with the exception of certain parts where permission from land owners is required. As for public access, the first pool appears approximately ½ mile from town and is known as “El Matadero” (The Slaugherhouse). This section has historical value as the municipality allowed dynamiting to change the course of the river bed. A mile beyond is the “Piedras Blancas”, a sector that receives substantial fishing pressure due to its proximity to the town. Further on good fishing can be had at the fork of the Curruhe River known as “la Curva del Manzano”. Both are filled with large trout near the end of the season as they congregate in pools with the lower river flows providing the opportunity to catch trout between 16 to 26 inches using light weight rods for nymph and dry fly fishing. A mile lower in the river is the pool known as the “La Marquesa’ and the confluence of the Quilquihue River which is about ½ mile from National Route 234. Starting from here are several lodges on private property with limited access to the river. 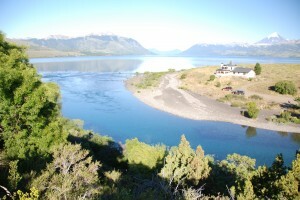 The lower section of the river flows through private land that starts at the fork of the River Quilquihue which has a public access. Beyond this entrance you must pay proprietors to gain access to the river. 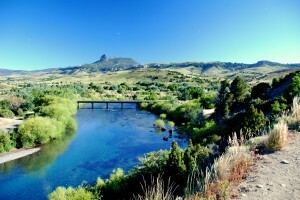 All of these sections provide spectacular fishing and incredible landscape. Fishing season starts in November. At this time the Chimehuin level is high because of the run off, but as it doesn’t have many tributaries and all its waters comes form snow melt the waters are really clear. It is a great time of the year for fishing with streamers trying to catch the Big brows of the river. Because of the water level at this time the best option are floating trips. While the weather start warming up hatches of mayflies will show up. December is the time of floating lines and small dries without forgetting streamers. Also in the “hatches” we have to mention ” The Inch Worm ” which appears during this month all the way to February. Inch Worms hang from the willows along the bank while big fish are waiting for their fall down. During this period and all the way through February full day excursions wading or floating or overnight trip of one or two nights are great options. Overnight trips are organized in the low part of the Chimehuin River, floating more than 30 km of incredible waters. 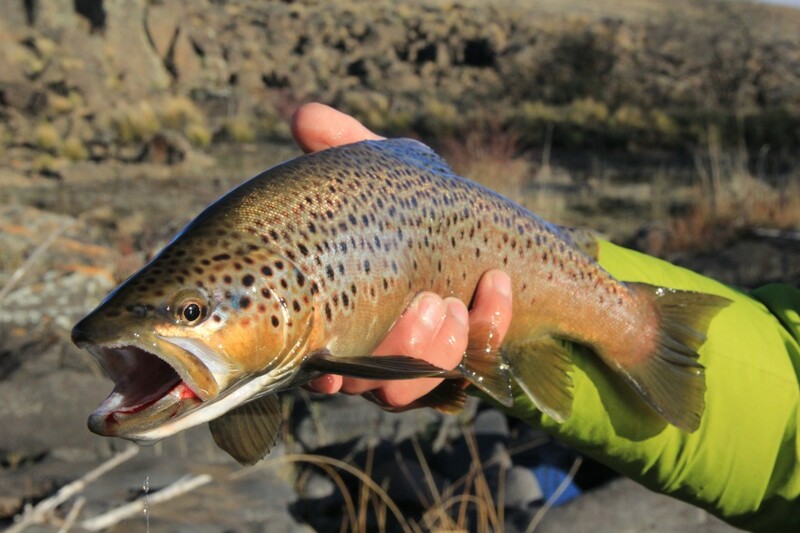 Where is possible to fish with different techniques, like dry flies or streamers, on the main river or on the side channels. This is a very high recommended excursion and the only way to fish this stretch of the river if fisherman are not staying at lodges.